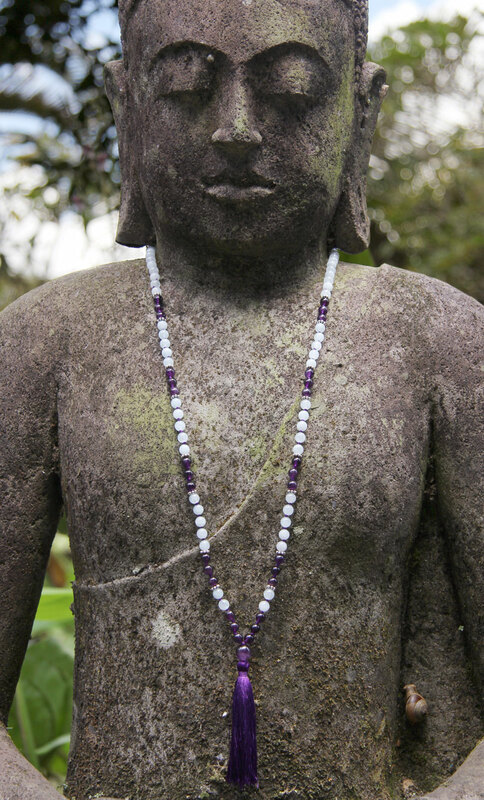 The Shanti Mala has 108 prayer beads of beautiful Amethyst and Aquamarine semi-precious stones. Aquamarine is a powerful meditation stone and it brings us great peace and serenity. Amethyst is a protective crystal and also provides wonderful peaceful energy for meditation. 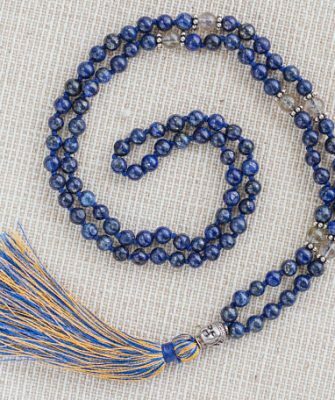 You can use the Japa Mala for praying and meditating or it may be worn as jewelry as a constant reminder of your spiritual connection. A silver sterling spacer is inserted after the 5th and the 8th bead. 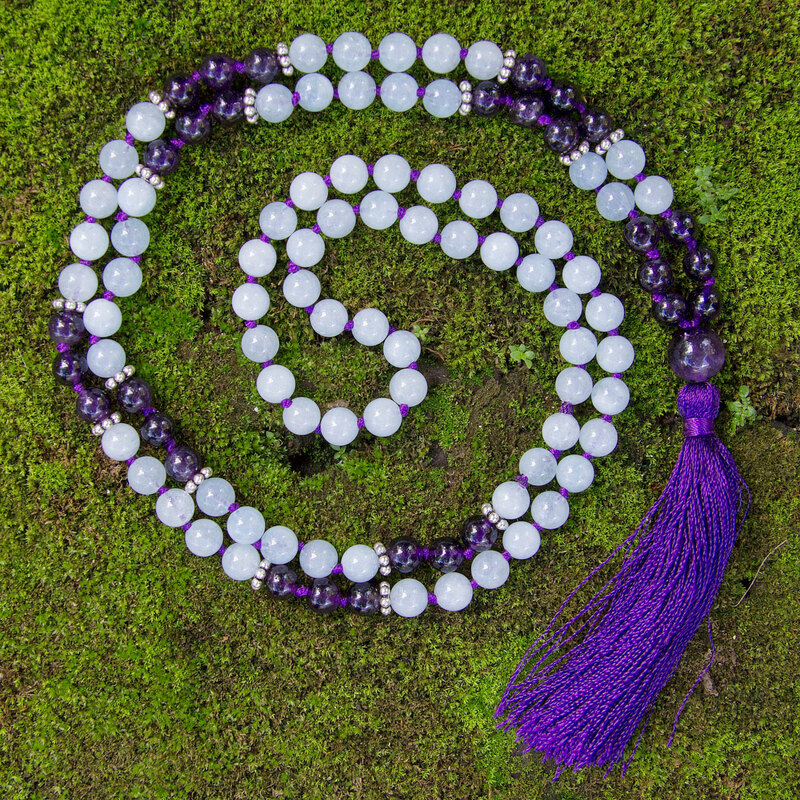 This sequence is repeated 8 times giving the Mala a total of 16 pure silver spacers. 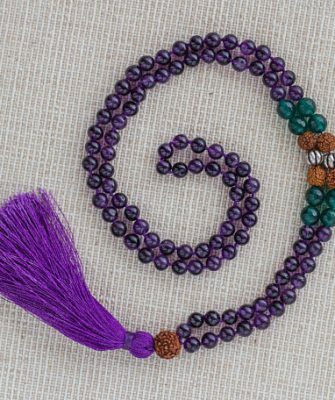 A handmade silk tassle is attached to the large main Amethyst bead known as the Guru bead. 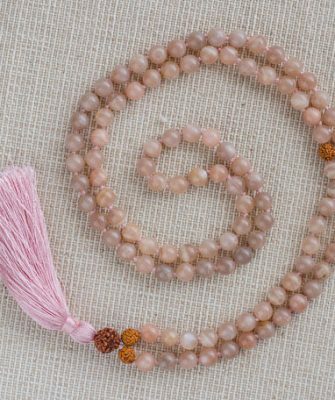 The total length of the Mala including the tassle is 50cm (19.75″) and excluding the tassle the length is 42cm (16.5″). The stones and silver spacers all come from trusted high quality sources in India and Bali and they are a true representation of nature’s intent; none are artificial. We believe Mother Nature graces us with incredible beauty and we have much respect, love and gratitude for her! Aquamarine is a powerful meditation stone and it brings us great peace and serenity. Aquamarine resonates with the energy of the ocean, helping the holder to connect with the nature spirits of the sea. Seamen carried Aquamarine in ancient times to promote safe travel on the water and to protect against drowning. The soothing energy of Aquamarine makes it a perfect companion to calm fears and phobias. Aquamarine is a “Stone of Courage and Protection”, often used with the Throat Chakra, Aquamarine can be used to promote verbal self-expression. It is often used to enhance spiritual communication and clear communication blocks. Aquamarine is also used to align all of the chakras and enhance the aura. The metaphysical properties of Aquamarine make it an excellent stone for the spiritual initiate. Amethyst is a very powerful and protective crystal. 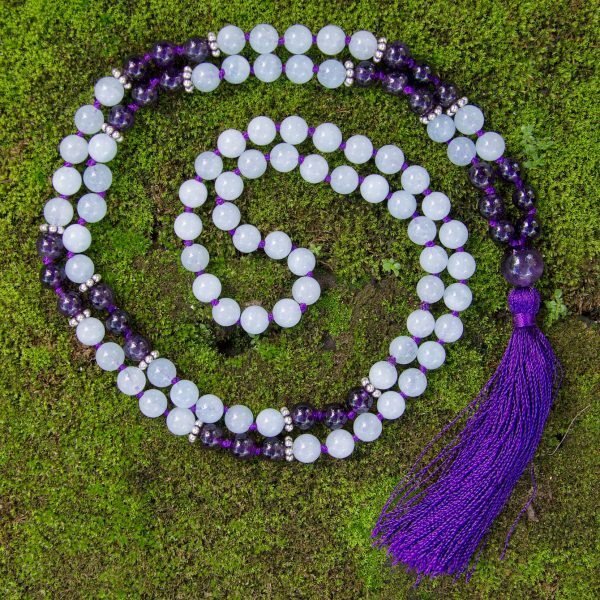 It can connect the physical plane with the higher realm, making it a good choice when working with the Third Eye Chakra. Amethyst also provides wonderful peaceful energy for meditation, stimulating our intuition and developing our psychic abilities. This gorgeous stone opens and activates the Crown Chakra as well, allowing easier access to the divine; it enhances spiritual awareness and spiritual wisdom thus promoting a higher state of consciousness. Physically, Amethyst can help alleviate headaches and migraines. It dispels nightmares and helps reduce insomnia. This stone can also reduce eyestrain, especially when working at the computer. 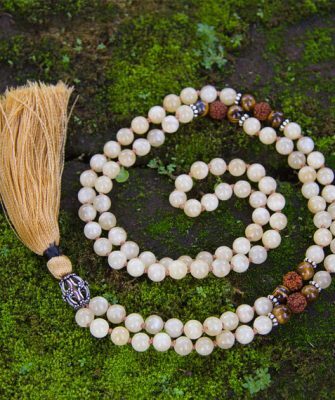 You can use the Japa Mala for praying and meditating or it may be worn as jewelry as a constant reminder of your spiritual connection. Please wear and hang them with care.